But, this trip wasn’t just about food and conversation. We camped under the live oaks, avoided the poison oak on the hillsides, spent a good part of Saturday exploring the neighboring geological features at Rock City and tried our hand at geocaching. Most of us were new to geocaching, so this was a fun exercise in learning to use a GPS device as well as learning some of the culture of geocaching. 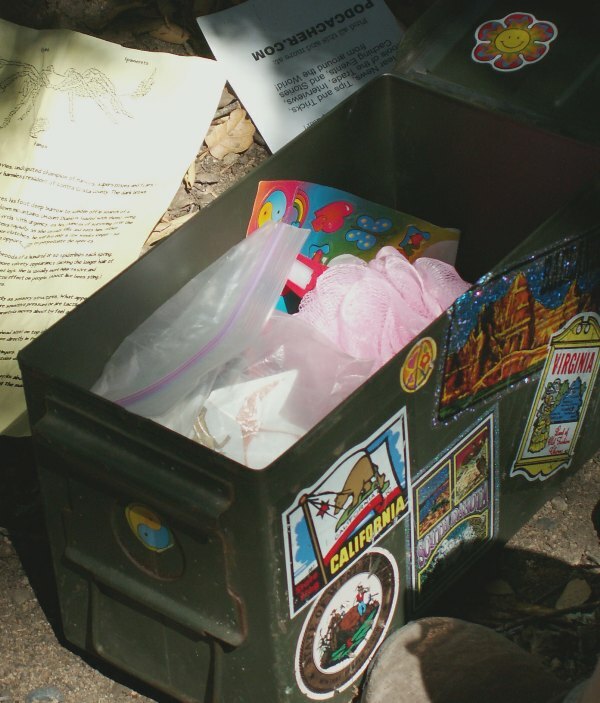 In short, geocaching involves using a GPS device to navigate to a specific location identified by a set of coordinates, then looking for a hidden box with a logbook. Boxes are typically ammo boxes (as shown in picture at right) or a plastic container (held by David in picture below) and usually also contain swag (trinkets to trade) and occasionally a travel bug. We found both. Special thanks to David and Jean for introducing us to this activity. Thanks to Steve for the photos. We visited three sites. One of the locations was pretty cool geologically. The hints from the geocaching website said something like “you’re there when you see the alien pods.” We all agreed that this was a perfect description of the rock formation. 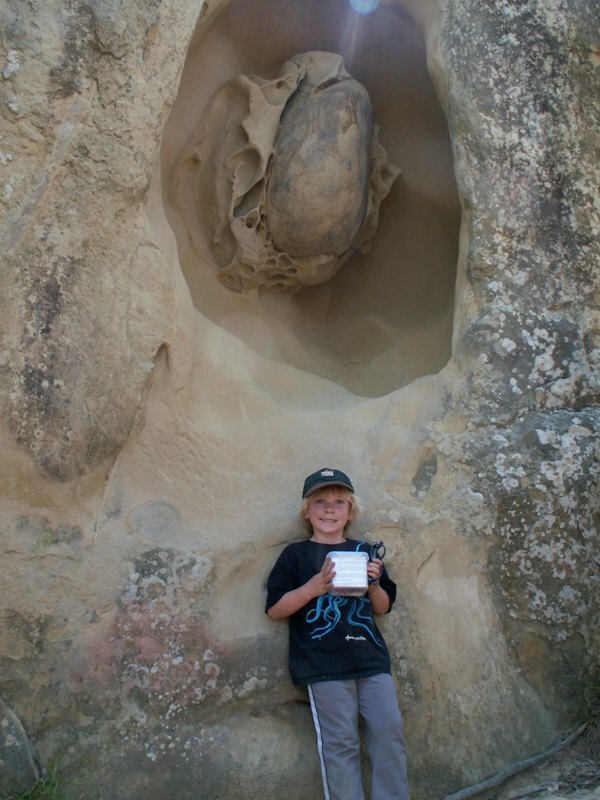 You can see how large a feature it is by comparing to David’s height in the photograph. The full moon made for a beautiful hike Saturday night. Several people said they heard owls and coyotes during the night, but I wasn’t so lucky. Both mornings (or was it evenings?) a large family of quail came wandering through the campground. All in all, it was a great weekend, part vacation and part staycation.